It bundles Blu-ray, networked AV and off-air HDTV into a pleasantly presented package. But is this enough to impress? We've certainly seen some interesting combos in the past: VCRs with onboard surround hard disk recorders, TVs with built-in DVD players, and iPod-ready melons. Okay, we might have made the last one up. 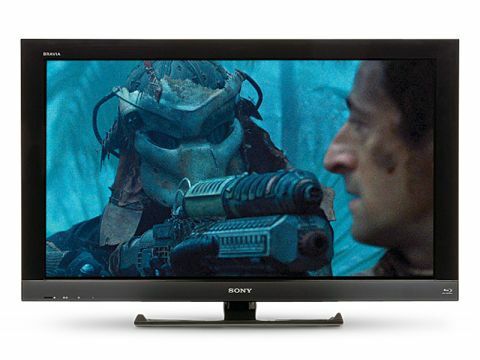 Taking us back to into the solid realms of reality, though, is Sony's KDL-40EX43B, which updates the DVD/TV concept by combining a smart-looking 40in LCD TV with a Blu-ray player. This CCFL-backlit full HD TV also boasts a Freeview HD tuner and networked multimedia (Bravia Internet Video and DLNA playback), and so it's no slouch where other features are concerned. The vertically-mounted disc player, which is, of course, also compatible with DVDs and CDs, lurks behind the screen and is slot-loading. As a result, it doesn't spoil the minimalist lines of the set's cabinetry. Indeed, you don't even know it's there unless you're looking for it. Other goodies on offer include Sony's Bravia Engine 3 picture processor, a PC VGA/D-Sub input and various energy-saving features (such as an ambient light-sensor and a radio mode that temporarily shuts down the screen). There's an analogue tuner, but chances are that it will never be used. The Blu-ray player gives you most of the functionality associated with a well-designed budget unit – such as BD-Live compatibility and the reasonably fast loading of discs. Apart from BD-Live, there are no fancy network features – these do, after all, fall within the TV section's own remit. Note that the Bravia Widgets platform (a separate entity to Bravia Internet Video, which currently includes Facebook, eBay, Flickr and Twitter) isn't present on this particular set. Also designed into the KDL- 40EX43B is a USB port for attaching memory devices – whether for multimedia playback, or providing a BD-Live temporary storage alternative to the set's own memory. There's only one port, though, which makes life rather difficult if you opt for the Wi-Fi dongle. Analogue connections include component and a pair of Scarts. Missing in action Most of Sony's recent LCDs boast four 1080p24 HDMI v1.4 inputs. Not so the KDL-40EX43B, which only gives you three, two of which are side-mounted. I suspect that the Blu-ray player accounts for the missing one. The Blu-ray player element of the TV is superbly integrated into the Xross Media Bar user interfacer. From here, you can – in addition to discs – select internet delivered TV content and DLNA media servers with much the same ease as digital (and, come to think of it, analogue) TV channels. The Xross Media Bar is also needed for any setup beyond the wizard-driven 'first-run' stage. I did have some problems getting the KDL-40EX43B to talk to my network via Ethernet. Although DLNA content was accessible, Bravia TV channels weren't. If, as I did, you get nothing more exciting than a '2200' error, reset your router and repeat the TV's network setup procedure. All should then be well. In addition to such delights as Demand Five, FIFA highlights, DailyMotion, Eurosport and YouTube, the BBC's iPlayer is listed among the Bravia TV channels. However, I could not force the software update necessary to view programmes (you're at Sony's mercy here, because this task is carried out automatically and, assumably, over-the-air as opposed to via the more sensible network route). I did come across some other niggles, some of which are more serious than others. The number of formats supported by the DLNA media player are restricted to JPEG, MPEG2 and MP3/WAV, although DivX/XviD clips can be fed in via USB. Then there's the infuriating, but well intentioned 'i-Manual', which to be brutally frank is no substitute for a pukka paper print. Resume Playback should also be offered; temporarily switch from, say, a Blu-ray to TV and there's no choice but to start playback again from the very beginning. Annoying, to put it mildly. The most significant limitation of all, though, will be discovered if you want to partner the KDL-40EX43B with an off-board home cinema system. It can only deliver 5.1 Dolby Digital or DTS soundtracks via the HDMI using the Audio Return Channel, (which resulted in too many dropouts with an Onkyo HTS-3305 to be of any value), or an optical digital output that's, thankfully, far more reliable. No provision has been made for hi-res or multichannel PCM, presumably because of connectivity bandwidth limitations. Picture quality is, on the whole, remarkably good and especially if you've done a basic calibration, perhaps with Video Essentials or the THX Optimiser built into some DVDs. The colour tone is vivid without being overblown, and a commendable lifelike character is imparted to all decent quality sources. Likewise, the dynamic range is good enough to convey delicate shadow details without bleaching highlights. The KDL-40EX43B doesn't have the fancier MotionFlow video processing of Sony's more expensive models, but that's no bad thing. Movement, with 24p Blu-ray is filmic rather than artificially smooth. The black level isn't, however, the best-in-class; this is where LED backlighting could have made a positive difference. Blu-rays and hi-def TV from the Freeview HD tuner reveal the pristine resolving power of the full HD screen; upscaled DVDs also look superb with a surprising freedom from unwanted artifacting. Film grain is shown as just that – as opposed to the 'mush' of lesser TVs. Standard-def Freeview channels don't fare as well, 'feathering' effects frequently being noticed around outlines. In contrast, sound quality from the downward-firing speakers mounted in the bottom of the cabinet is disappointing. Lacking depth and any presence at the frequency extremes, it doesn't do justice to TV programmes, let alone Blu-ray's sonic potential. Although you can compensate for the lack of treble sparkle with an upwards tweak of the relevant tone control, the bass is beyond help – those tiny transducers can only go so far. Indeed, if the bass control is set too high, then you can expect all manner of unpleasant cabinet rattle and thrum. Virtual surround is an option, but this makes little worthwhile difference. Quality-minded users are therefore advised to pump disc and TV sound via an external audio system. Although the only possibilities here are regular DD/DTS bitstreams or two-channel 16-bit/48kHz PCM, the results are nevertheless preferable to the TV's own audio system. And with the budget AV systems likely to be partnered with this set, chances are that you would be unlikely to tell apart a regular Dolby Digital 5.1 soundtrack from a TrueHD one.